November 17, 2013 - Bombardier Aerospace announced that Learjet has been awarded Federal Aviation Administration (FAA) Certification for its Learjet 75 aircraft. The light business jet is the latest in Learjet’s development program in anticipation of business aircraft recovery predicted by Bombardier. The airframe is based on the Learjet 45 model with modifications to improve performance. 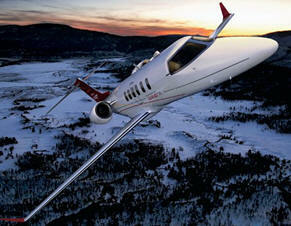 The business jet will feature new avionics, winglets and powerful engines that use less fuel. “We are delighted to have received FAA certification for the first Learjet 75 business jet”, said Ralph Acs, Vice-President and General Manager, Learjet, Bombardier Business Aircraft. FAA certification for Learjet 75 aircraft was received on November 14, 2013. Certification and delivery efforts and activities are in progress for the Learjet 70 aircraft. The Learjet 75 aircraft has enhanced performance through an engine thrust increase with an improved Honeywell engine, offering improved takeoff field length performance over its predecessor. The new avionic system contributes to achieving weight savings and the new canted winglets improve aerodynamic efficiency. Overall, up to a nine per cent improvement in field performance under hot and high conditions and up to a four per cent improvement in fuel efficiency is expected. The aircraft will be supported by a maintenance program designed to allow customers to operate to a generous 600 flight hour fixed inspection interval at Bombardier’s growing worldwide Customer Services infrastructure. In addition, direct operating costs will be reduced as a result of performance efficiency gains. Based on the Learjet 85 aircraft interior design and technology, the Learjet 70 and Learjet 75 aircraft include improved comfort and styling of the seats; cabin management system features individual touchscreen monitors with full audio and video control; LED lighting throughout the entire aircraft; a generous baggage suite and a spacious galley for optimized catering, work and storage space. The advanced connectivity options of the Learjet 70 and Learjet 75 aircraft ensures the highest levels of convenience. A breakthrough in business aviation, the Bombardier Vision Flight Deck is designed to deliver a completely new cockpit experience. By combining the best in technological advancements with superior design aesthetics, it provides pilots flying Bombardier’s Learjet 70 and Learjet 75 aircraft an unprecedented level of control and comfort. The Bombardier Vision Flight Deck for Learjet 70 and Learjet 75 aircraft features the fully integrated Garmin G5000 digital avionics suite, designed with leading edge technology and one of the most intuitive crew interfaces available. Learjet 70 aircraft: The Learjet 70 aircraft will be able to achieve an exceptional range greater than 2,000 nautical miles at cruise speeds of up to Mach 0.81. It will connect Chicago-San Juan and Toluca-Minneapolis non-stop with six passengers and two crew members. Learjet 75 aircraft: With a maximum range greater than 2,000 nautical miles at cruise speeds up to Mach 0.81, the Learjet 75 aircraft will be able to fly four passengers and two crew members non-stop from Los Angeles to Toronto and Mumbai to Bangkok. Additionally, it will be able to handle a range close to 1,950 nautical miles with eight passengers.